I have been called the denim whisperer, because of all the things that I make with old jeans. From sunglasses cases, magazine racks and pocket organisers. I just love upcycling with old denim. 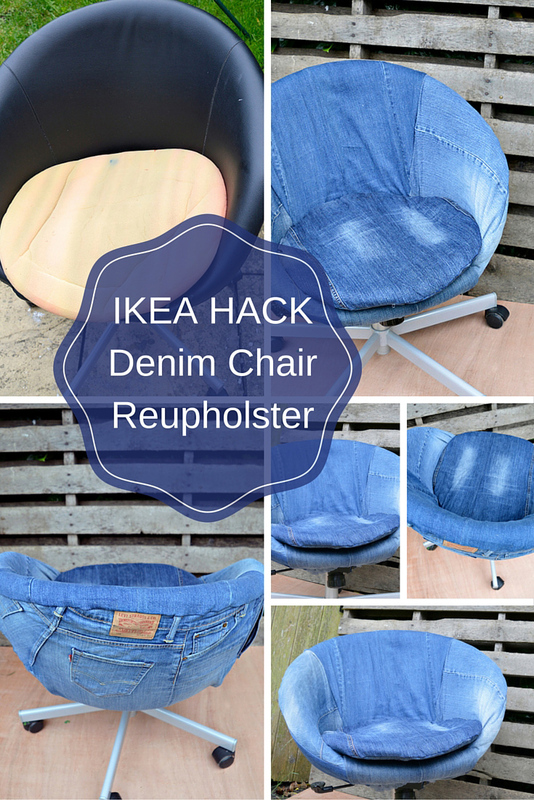 So when my office chair was in need of a makeover then this Ikea hack had to involve denim. This isn’t my first denim chair upcycle, in the past I’ve upcycled a dining room denim patchwork chair and footstool with old jeans. I’m sure it won’t be my last either. Upholstering in denim is a lot easier than it looks, especially with a bit of staple gun magic. Ikea Skruvsta office chair – However, this tutorial should work for most upholstered chairs. First you need to make a pattern. Use pattern paper to do this. If you look at the Ikea Skruvsta chair, you can see that the cover is sewn in six different sections. I pinned the pattern paper to the chair and marked out each section on the paper. 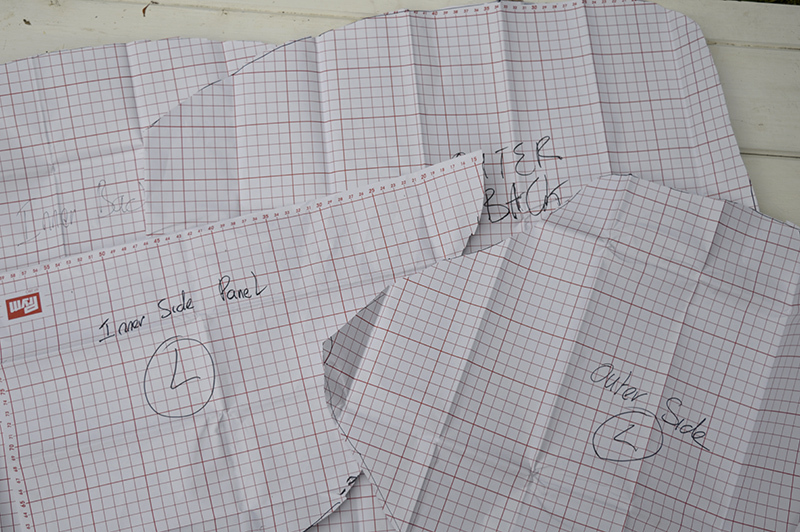 I then cut out the paper pattern for each cover piece on the chair. The left and right panels of the chair where just the mirror image of each other, I only cut out one pattern for both. I then just flipped the paper pattern over when cutting out the opposite side. To make large pieces of denim, cut your jeans up the inside leg seam. Flatten out and then stitch the legs together so that you end up with one large piece of denim fabric. Pin your pattern paper to the large pieces of denim. 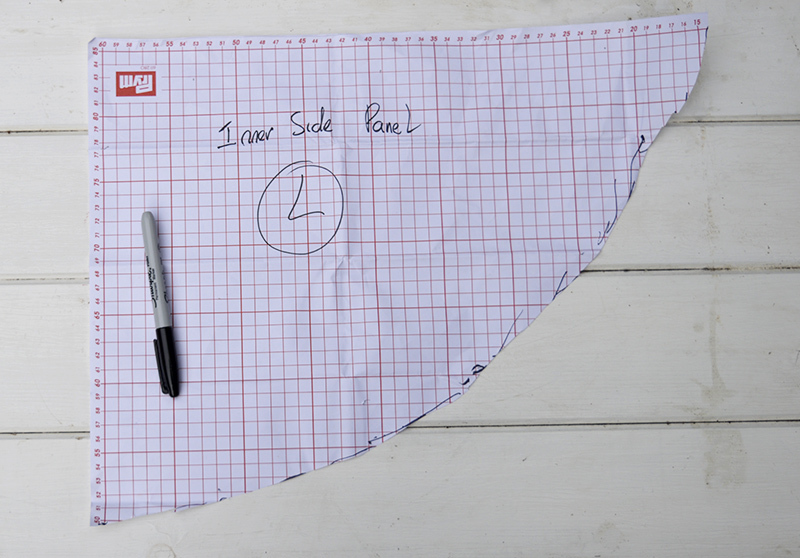 Allowing for a seam of approximately 1cm cut out your 6 pattern pieces. Pinning right sides together, sew up the three outer back pieces together and then the three inner pieces together. Then sew these to sections together. 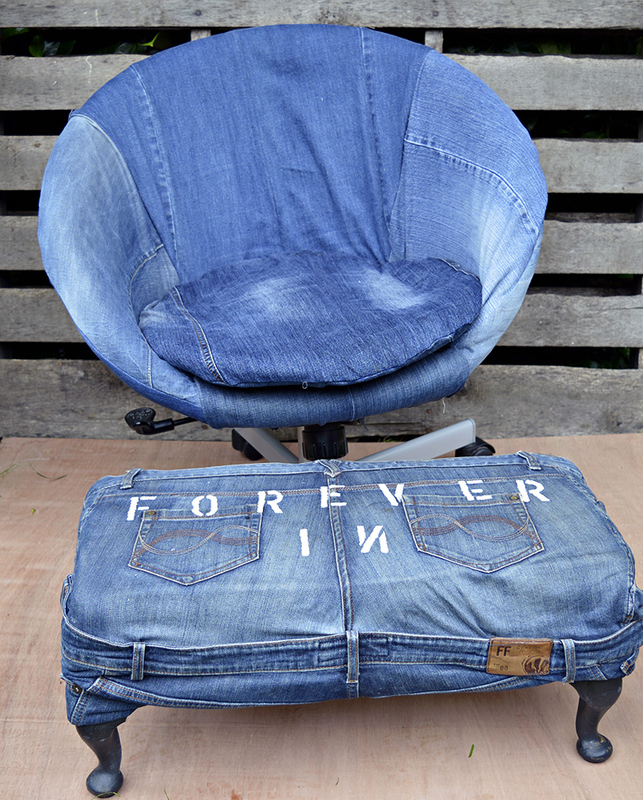 How to fit your denim cover to you chair. This is where the staple gun becomes the star of the project. 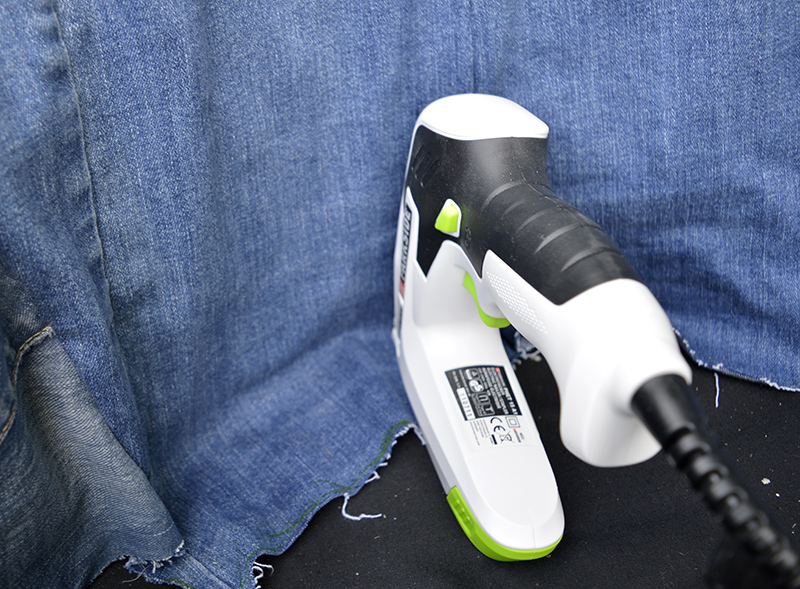 Staple guns let you cheat with upholstery and makes it easy. 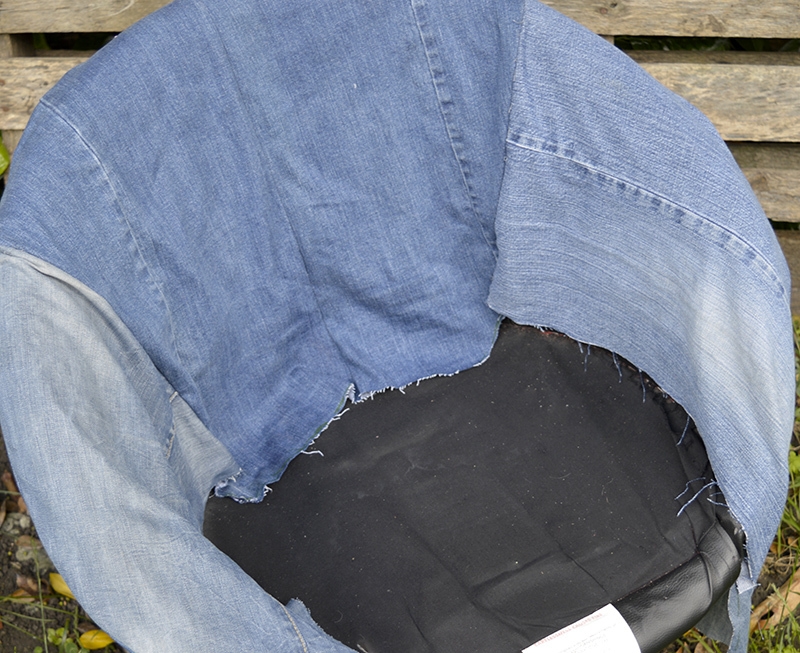 Place your newly made denim cover over the chair. Making sure the newly sewn seams in your cover match up with the seams in your chair, pin the cover to the chair along the top. This will hold it in place whilst you staple the cover to the chair. Pull the inside of the cover taut and staple to the inside seat of the chair. This may look unsightly but don’t worry as the chair cushion will hide it. You can never have too many staples holding it in place. Turn the chair over and repeat with the underside of the chair. Pulling the cover taut as you merrily staple away. Don’t forget to take out the pins at the top when you have finished. 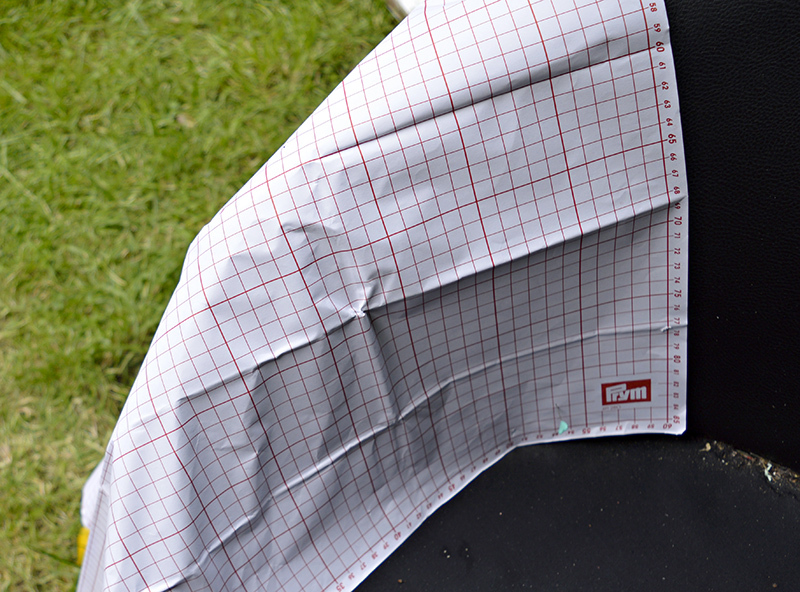 Making the seat pad cover. 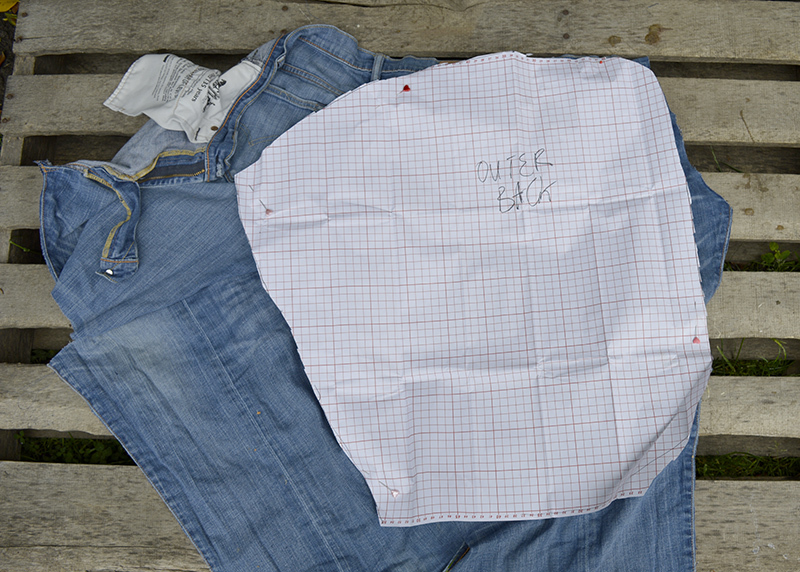 Draw around the seat pad onto a large piece of denim allowing for 1cm seam allowance and cut out. Repeat so that you have 2 identical denim pieces. Pin and sew right sides together leaving an opening for the pad. 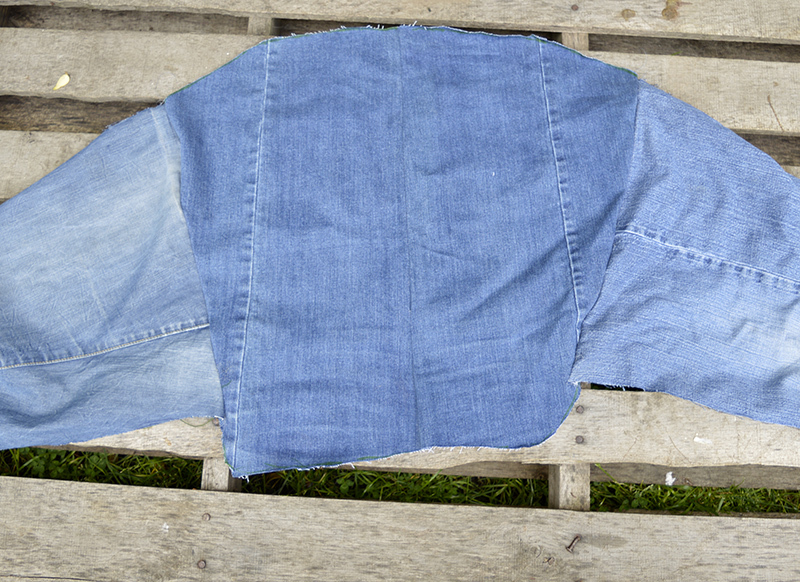 Turn the denim right sides out, squeeze in pad into the cover and stitch up the opening. This project only took me a couple of hours and I love this Ikea hack of my office chair. 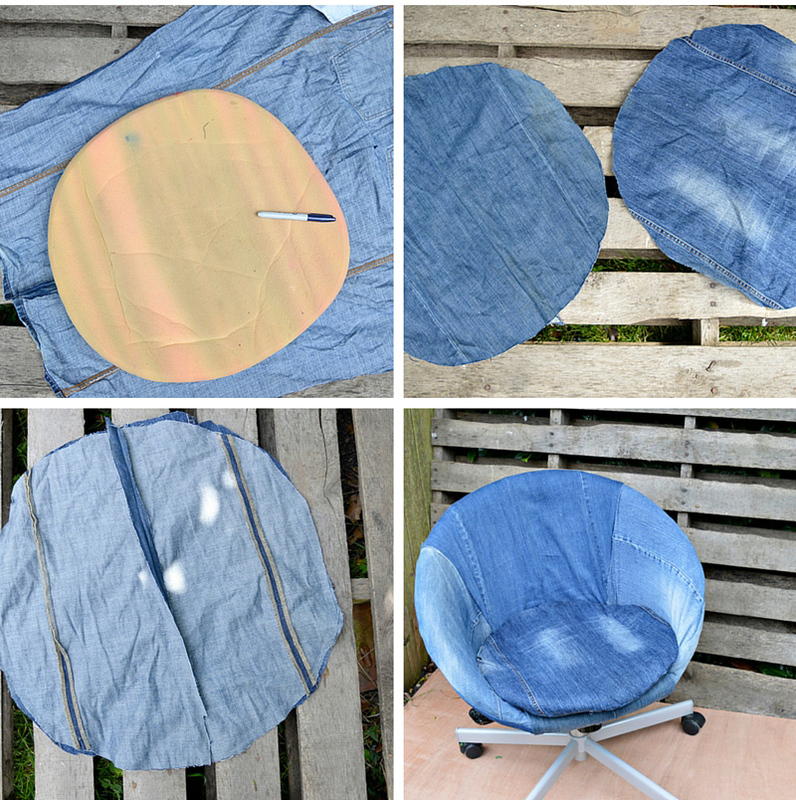 This method can be used to reupholster any chair in denim. 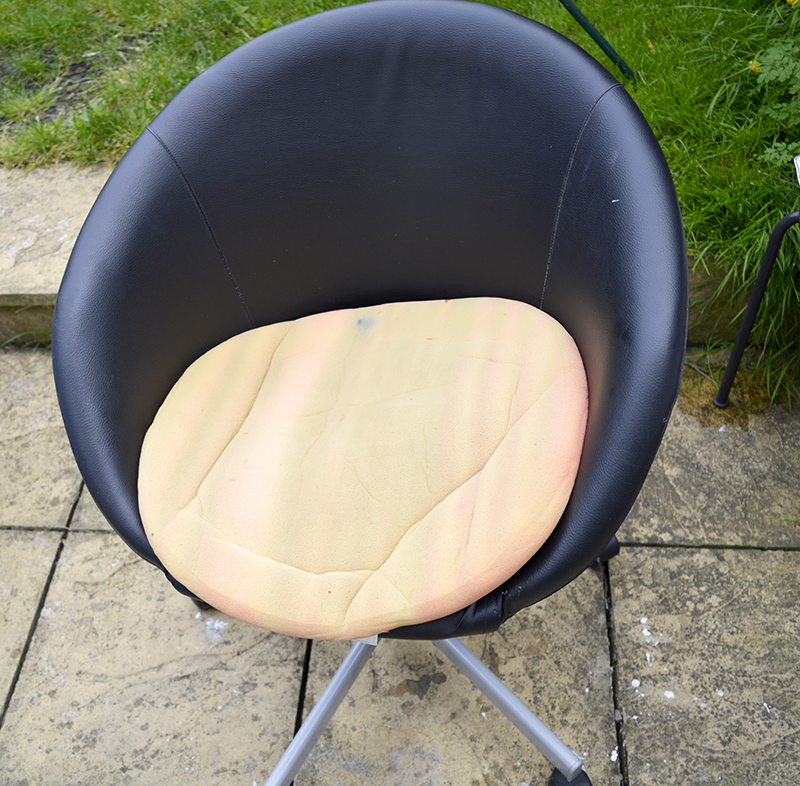 If however you are going to upholster something like my dining room chair seat then you may want to use upholstery tacks instead of a staple gun or both. If you like the “SIT DOWN” cross stitch pillow in the picture, click here for a free pattern and tutorial. This is one of my most pinned crafts my Ikea Hack map table. 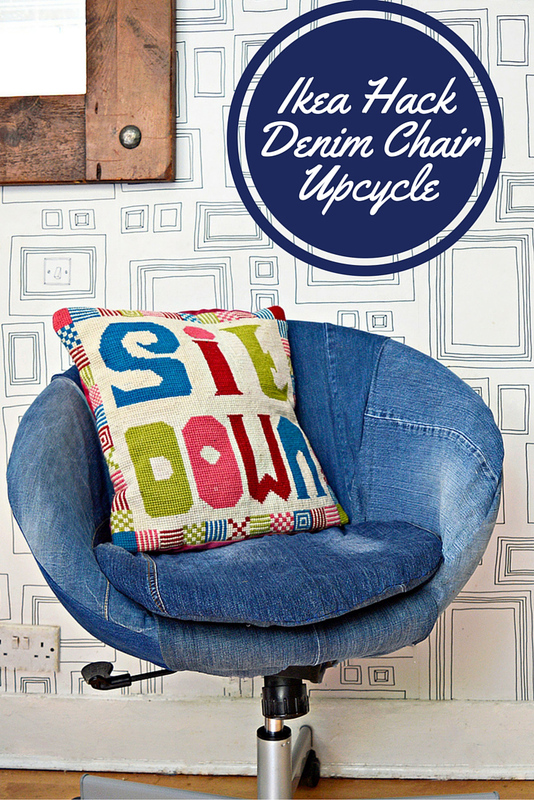 A cool upcycled waistband denim rug to go with the chair. 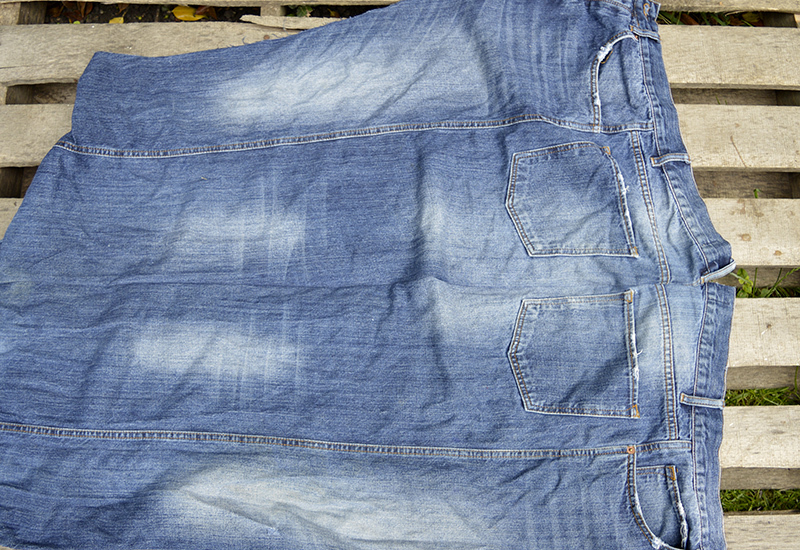 (This is a no-sew denim project). Or perhaps a giant world map denim floor cushion to match too! Removable slipcovers would be cool too but extra work. I do find the denim very robust though. Thanks you. It really looks great! And the green chair is totally awesome! That shade of green is very much Greenery, which is so trendy this year! 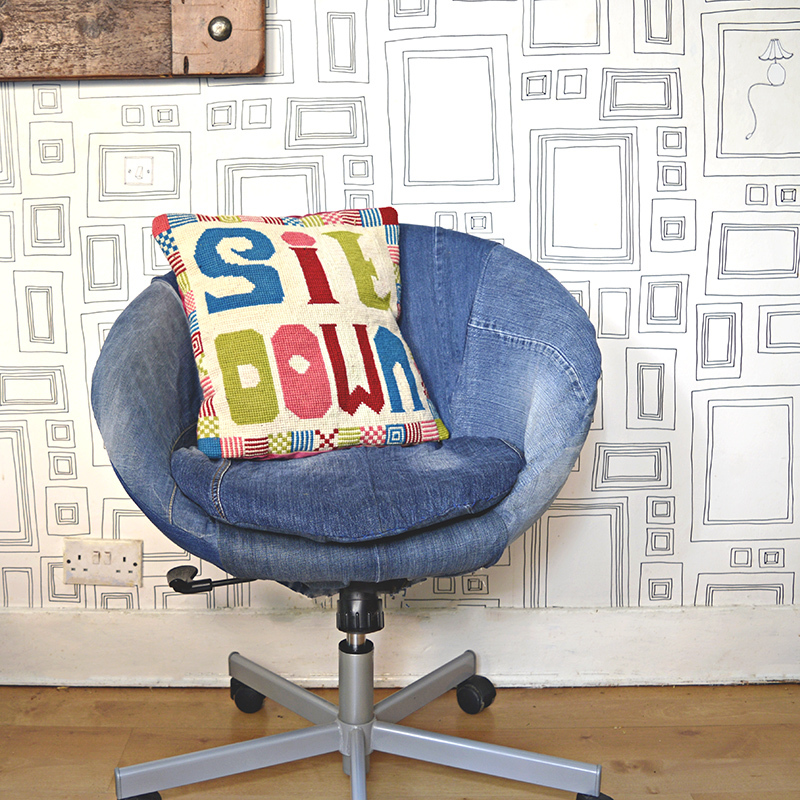 Thank you, loved your denim chair too! What a clever and adorable idea. not only re-purposing, but also creating awesome projects. Too cte for words. As always we appreciate you at DI&DI. This is awesome — my kids would love it! Thanks for sharing at Merry Monday! Thanks ! 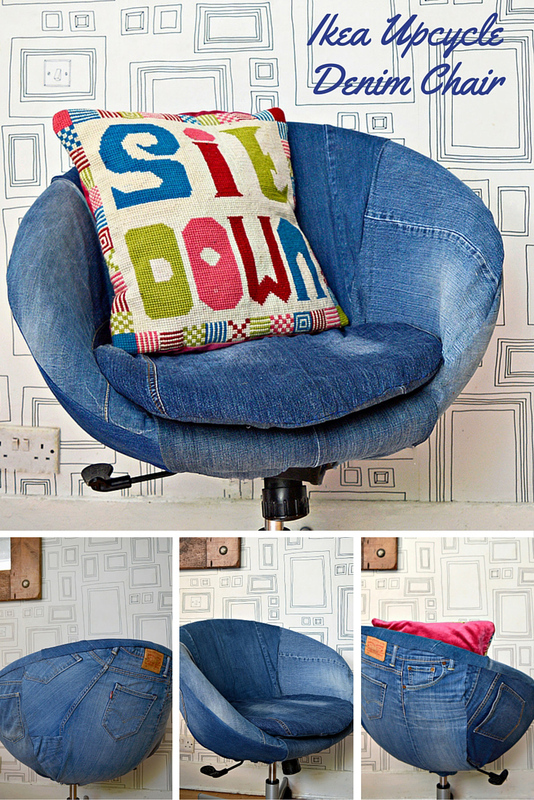 Your chair looks awesome too like the contrasting denims. Maybe I’ve led a sheltered life but this is the first denim covered chair I’ve seen. It was a pleasure to see this in the line up at Celebrate Your Story, thanks for joining us! Thank you ! Pleased you liked it. Your chair turned out great and I just adore the cross stitch pillow! Thank you for sharing on Family Joy Blog Link-Up Party. Hope you are having a great week! This is fabulous–so retro cute. And I am swooning over the needlepoint pillow! Thanks for sharing on the Talk of the Town link party! Thank you ! The pillow is one of my favs too. You make this look so easy, Claire. I’ve never used a staple gun. Maybe it’s time I did. Your new chair looks terrific. Thanks ! Staple guns are great for upholstery, they make it so much easier. Thank you very much look forward to seeing it. 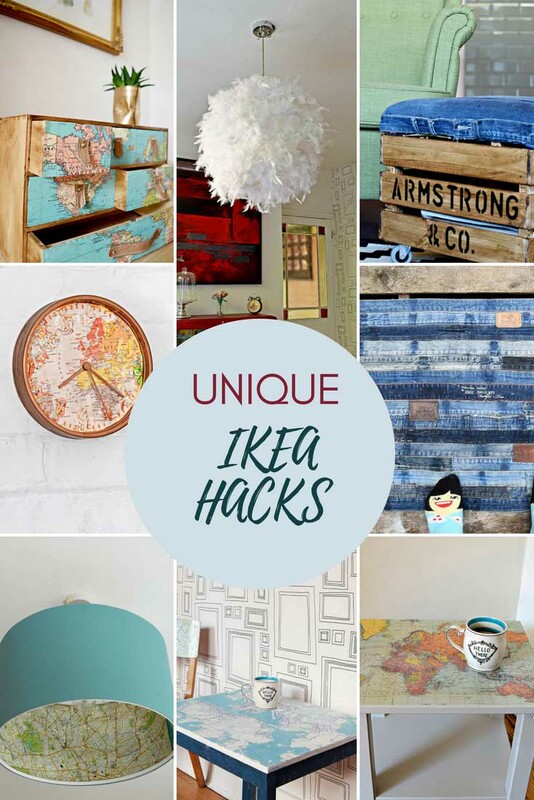 Claire, I love a good Ikea hack and this is just FUN! Thank you for sharing @Vintage Charm! I love your denim projects! They are very cool and inspiring. Thank you ! I love the wallpaper too it’s in my dinning room. Love a great Ikea Hack. Beautiful job and tutorial. Thank you very much ! Ikea Hacks are great fun. Cheers and thank you ! The footstool is a favourite of mine I did a few years ago and is also a homage to Neil Diamond ! This is such a clever idea! I would love to do something like this in my son’s bedroom. Great job! Thank you ! I bet it would look great in your sons room. Brilliant, looks fab and you make it seem pretty do-able too, thanks. Thanks, it is surprisingly easy especially with a staple gun. Claire this is the coolest project. Actually, all of your projects are very cool. I really like your aesthetic. I said it before and I’ll say it again, I love denim and this is the perfect way to repurpose it. Sharing and Pinning. Thank you, glad you liked it, and thank you for your kind words. You are such an inspiration Claire, love the dining room chair too…..thanks so much for sharing on craft schooling sunday! Thank you and thanks for the kind words ! Thank you ! & your apron looks sweet. Hi, Claire! This is complete and utter awesomeness! 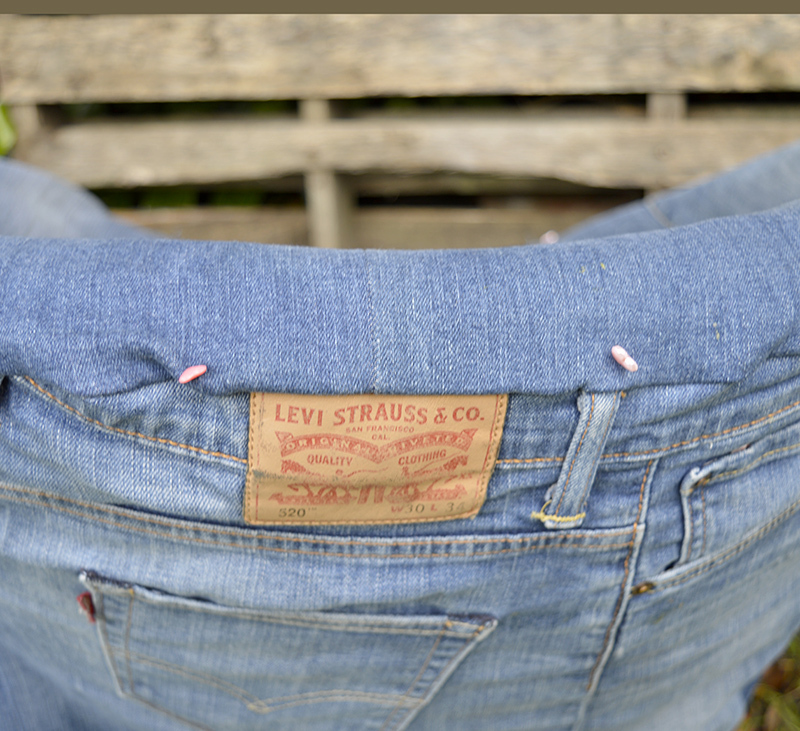 And so smart to use the bumpy bits of the jeans for the back so that part gets used up, too. I agree, you are the denim whisperer! This looks great – like a completely different chair! Thank you Medina ! It was in need of a revamp and I love it in my home office. Oh, I love this! Love that pillow too! Thanks ! There’s a free pattern for the pillow here https://www.pillarboxblue.com/supersized-cross-stitch-cushion/. Thank you ! Yes and I have 3 teenage boys myself, which also means a plentiful supply of old jeans. Thank you look forward to seeing it ! 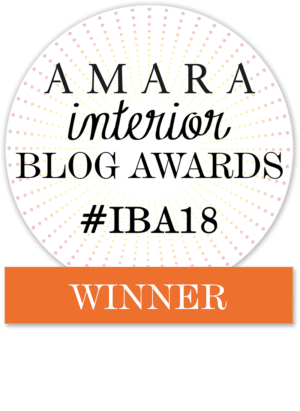 A blue jean chair! What more could you want? It’s adorable. Thank you very much ! I’m sitting on it this very moment. When I grow up I want to be just like you! always you are showing such beautiful, creative and fun projects! 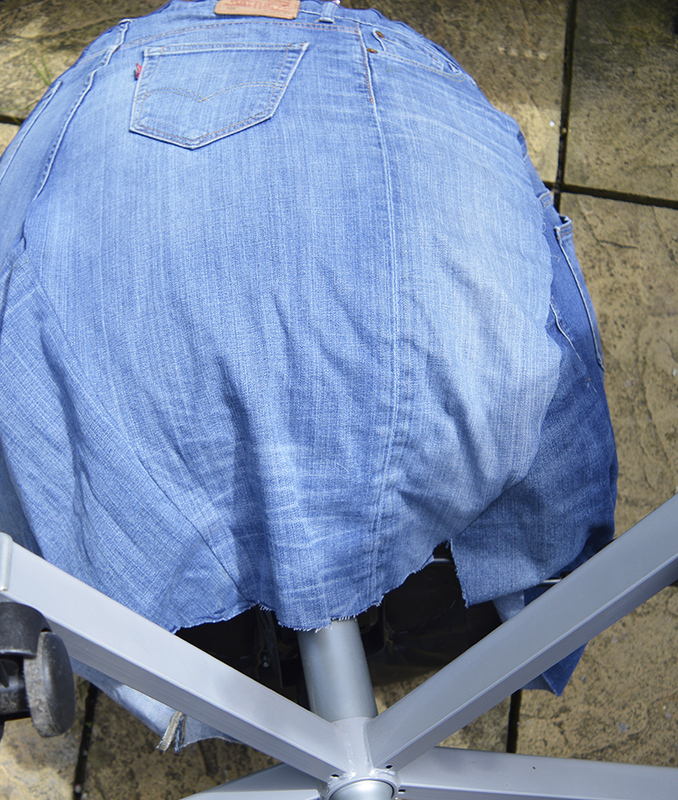 I am keeping an eye out, I am totally making a jean chair! Thank you, but I don’t think I’ve fully grown up yet ! I love this chair! You did such a great job giving it a makeover, and I love that you used denim! Pinned! Thank you ! I just love working with denim. I’m a big fan of denim recycling and have been wanting to reupholster a chair in denim for quite some time now, love how yours came out! Pinned to my Ikea board! Thank you ! You should do it, it’s not that difficult.